176 records – page 1 of 4. File contains correspondence, report and a list detailing all water courses in North East Burnaby-Burnaby Lake area. The list was compiled to examine possible water supply sources during droughts. This portion of the recording pertains to Robert "Bob" Lowe's memories of what it was like in the nineteen-thirties and forties for working people in Burnaby. Bob also discusses the history of Burnaby Lake. 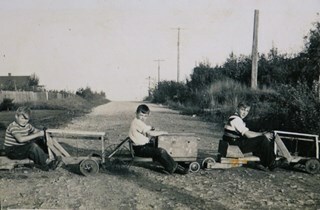 Robert "Bob" Lowe (at center) and friends riding soap box race cars, . Item no. 549-041. Recording is an interview with Robert "Bob" Lowe conducted by Burnaby Village Museum employee Eric Damer, November 5, 2012. Major theme discussed: the rise of the automobile and its effect on development in Burnaby. Robert "Bob" Lowe has lived his entire life in Burnaby. 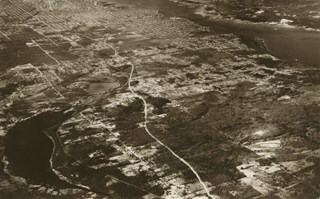 During his childhood, Bob’s family lived at several addresses near Royal Oak and what is now Canada Way. He attended Douglas Road Elementary and South Burnaby High Schools. After graduating, Bob worked for a few years before enrolling in Normal School for a teaching certificate. He began teaching in Vancouver, married in 1952, and started a family. The Lowes moved to Government Road in 1961 and began a hobby farm, while Bob upgraded his formal education and became an administrator in the new college system. Eric Damer is a lifelong British Columbian born in Victoria, raised in Kamloops, and currently residing in Burnaby. After studying philosophy at the University of Victoria, he became interested in the educational forces that had shaped his own life. He completed master’s and doctoral degrees in educational studies at the University of British Columbia with a particular interest in the history of adult and higher education in the province. In 2012, Eric worked for the City of Burnaby as a field researcher and writer, conducting interviews for the City Archives and Museum Oral History Program. Photograph of Burnaby Lake, looking northwest. The north shore mountains, including The Lions, can be seen in the background. File consists of photographs of Burnaby Lake and Still Creek, with an oil can and other debris in the water. Also included in the file are photographs of Canadian geese taking off and a man and woman kayaking on Still Creek. File consists of photographs of a group of men addling Canadian geese eggs on Burnaby Lake. 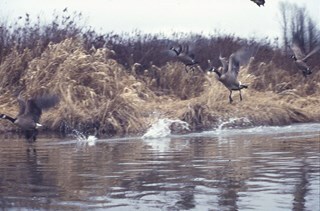 Addling is a wildlife management practice used to limit flock growth and stabilize bird populations. Photographs depict the men transporting their canoe to the water, canoeing, agitating geese away from their nests, and holding up eggs. 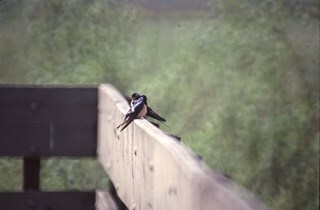 File consists of two photographs of a pair of barn swallows perched on the wooden railing of the viewing stands located at Burnaby Lake. File consists photographs of leaf-eating beetles being planted in Burnaby Lake. 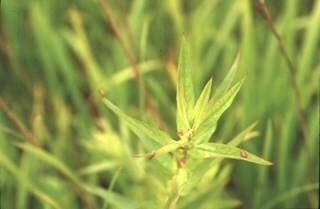 Beetles were released around the lake in order to reduce the population of purple loosestrife in the wetlands. Photographs depict a team of four individuals travelling around the lake by canoe, releasing the beetles from white styrofoam containers, and beetles on foliage. File consists photographs of a snow-covered Burnaby Lake and a snowy owl perched on a large tree stump. 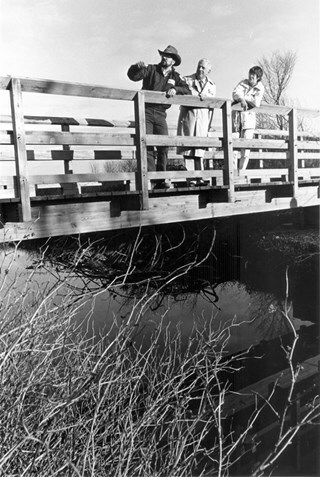 File consists of two photographs of Doreen Lawson at Burnaby Lake. 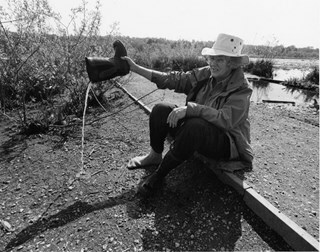 In one photograph Doreen is pictured sitting on the ground pouring water from her rubber boot; in the second she is standing up to her knees in the lake holding silt out towards the camera. Photographs were taken for use in newspaper publications. 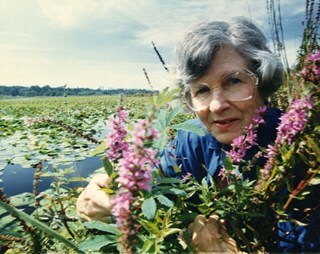 Photograph of Doreen Lawson posing with purple loosestrife plants with Burnaby Lake behind her. Note is grey ink on verso of photograph reads: "Dec. 92 / From Ethel Chernesky & Cam Avery"
Stamp of verso of photograph reads: "The News / [address] / [phone]"
File contains photographs of Doreen Lawson feeding a group of birds on the bank of Burnaby Lake. Stamp on verso of photographs 605-020-1 : 605-020-2 reads: "Photo by George Diack / Vancouver Sun"
Sticker on verso of photograph 605-020-3 reads: "Purchase or possession of this print gives no right of duplication, publication or other use without permission from the Vancouver Sun or Province. Contact INFOLINE at [phone]. Fax #: [fax] / 425-015"
Sticker on verso of photograph 605-020-3 reads: "Copyright - Vancouver Sun / George Diack"
File contains photographs of Doreen Lawson on Burnaby Lake. 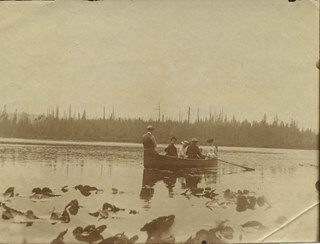 The photographs depict Doreen paddling a canoe with an unidentified woman, pulling a canoe through the water, and standing ankle-deep in the lake holding a pair of binoculars. Sticker on verso of photographs reads: "Purchase or possession of this print gives no right of duplication, publication or other use without permission from the Vancouver Sun or Province. Contanct INFOLINE at [phone]. Fax #: [fax] / 425-015"
Sticker on verso of photographs reads: "Copyright - Vancouver Sun / Photograph by Ian Lindsay"
Photograph of (left to right) Jimmy Hood (holding hockey stick), Elizabeth "Bessie" Stark and David Stark (sister and brother) skating on Burnaby Lake. 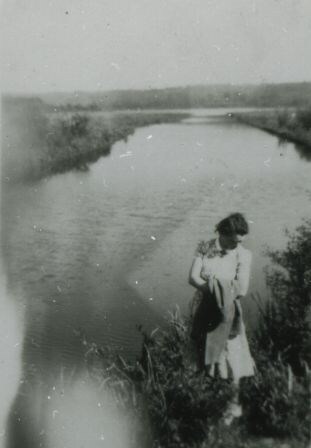 Photograph of Audrey Pontifex standing beside the water at Burnaby Lake. 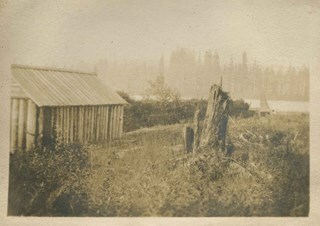 Photograph of the log boathouse at Burnaby Lake belonging to Bernard Hill. Photograph of the log boathouse at Burnaby Lake belonging to Bernard Hill. In the background can be seen the "Maid of the Mist," the Hill family's boat. Photrograph of the Hill Family and guests rowing in the "Maid of the Mist" on Burnaby Lake. Lily pads are visible in the foreground. Photograph of the Miles family enjoying the ice on Burnaby Lake. Ian Miles is skating in front with a rope over his shoulder, that is tied to a tricycle being ridden by two year old Emil who is at the back of the group. Martha Miles is skating behind her husband, holding on to their other son Jason's hand on one side, and on to the same rope that her husband is holding with her other hand. Newspaper clipping attached to verso of photograph reads: "FAMILY FUN ...Taking advantage of the cold weather, Ian and Martha Miles of Burnaby take children Jason, 4, and Emil, 2, for a spin on Burnaby Lake ice. the frozen lake drew 2,000 skaters on the weekend and hundreds more have been turning out in the evenings to enjoy the ice while it lasts. Skaters are advised to call their local parks and recreation department before skating to find out if the ice is still safe. The cool weather is likely to last until the weekend." 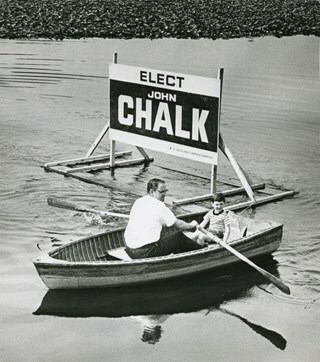 Photograph of John Chalk and his four year old son Timothy in a row boat, floating a large "Elect John Chalk" election sign out into the middle of Burnaby Lake. 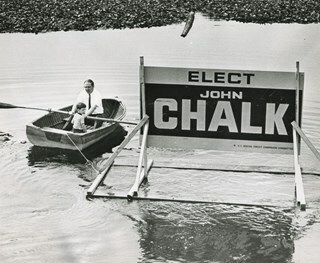 John Chalk was a teacher and was on the Burnaby school board from 1969 until 1972, when became the Social Credit candidate for Burnaby-Edmonds. 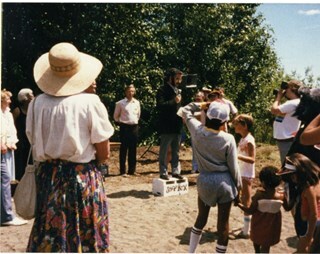 Photographs of the Burnaby Lake Official Dedication at Burnaby Discovery Day on July 7, 1985. The photographs depict the event of "Robert Burnaby" making a speech and unveiling the plaque. Note on verso of 261-020 reads: "July 7/85 Burnaby Discovery Day / Robert Burnaby escorted from Burnaby Lake by R.C.M.P. & piper to unveil plaque dedicating park." Note on verso of 261-021 reads: "July 7/85 Burnaby Discovery Day"
Note on verso of 261-022 reads: "July 7/85 Discovery Day / Robert Burnaby on Soap Box" and "Rosemary Brown / Robert Burnaby / Ritchie Smith / Doug. Drummond"
Note on verso of 261-023 reads: "July 7/85 Burnaby Discovery Day"
Photograph of (l to r): Bob Peers, his sister Betty, their father Francis and brother Geoff. A note on the reverse of the photograph indicates the location of the picture was Burnaby Lake, likely at Greyfriars, taken on the tennis court. Note on verso reads: "1920 -? 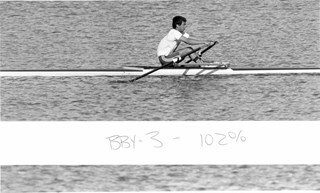 / Burnaby Lake"
Note on verso reads: "64"
Photograph of Chris Lee rowing on Burnaby Lake. 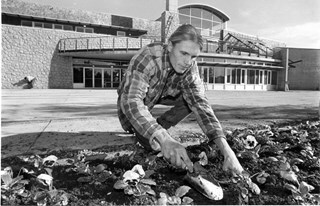 Note in black ink on recto of photograph reads: "2796 Bby Simone / Bby - 3 - 102%"
Photograph of Andreas Katzenneier planting petunias in front of the Shadbolt Centre for the Arts for the official opening on November 18, 1995. 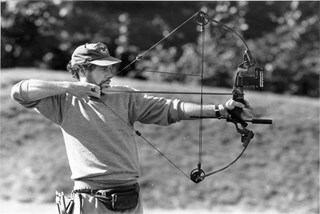 Note in blue ink on recto of photograph reads: "Mario Bby 2890 92% Bby 1"
Photograph of Allan Laurie of the Burnaby Archery Club and his crossbow at Burnaby Lake fields. Note in black and blue ink on recto of photograph reads: "Simone Bby 2797 / 68% Bby p. B2"
Photograph of Liz Thurstrom, of the Wildlife Rescue Association of British Columbia, Bob Gardner, of the Burnaby Lake advisory council and Ken Elliot, of the Greater Vancouver Regional District (GVRD) atop the new footbridge completing the Burnaby Lake Trail. 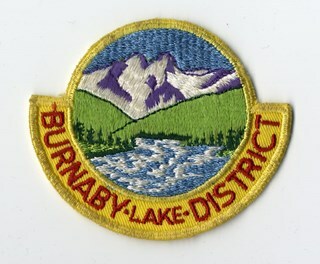 Note in black and blue ink on recto of photograph reads: "3454 A Bby Mario / 95% Bby p.1"
Badge, cloth, circular; yellow, green, white, red, blue; scene of mountains, river and field with a yellow bar across bottom with red lettering. Photograph of four men and a dog named Hector standing on a frozen lake, looking at a dead frozen deer. Some of them seem to be wearing skates. According to a catalogue record from 1977, the original print had written explanation stating: "Bruce and Bill [Patterson] with some friends found a wild deer frozen in the ice on Burnaby Lake about three miles from house. Not often do we get a winter like this." An annotation on the back of the photo reads: "Burnaby Lake / B. Paterson standing beside dog. / No date." Photograph of people skating on a frozen lake. The man in the centre is holding a camera in his hands. He is turning around to look at the photographer. There are two young women skating with him. Other groups of skaters can be seen in the background. The accession register and inscription on the photograph identify the location as Burnaby Lake. The annotation on the back of the photograph reads: "Skating Burnaby Lake / c. 1940." 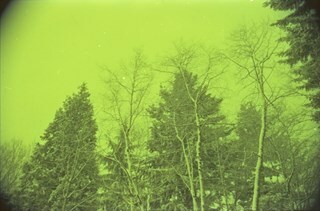 Photogravure taken from "Woodlunds." Annotations in ink on the back of the card read, ""Mr & Mrs G. Every-Clayton/ with Mr Haszard's/ wishes for a very/ Happy Xmas/ 1899" and "Looking from Woodlands / towards Burnaby Lake in 1899." Later annotation in blue ballpoint pen read, "Woodlunds the residence of Mr. Geo. Every-Clayton stood on the site of the present Centennial Pavilion, which when originally built was the residence of Mr. and Mrs. H.T. Ceperley. The proceeds from its sale was used to prepare the Ceperley playground in Stanley Park. The house in the left centre was that of Mr. and Mrs. Bernard R. Hill demolished to make way for entrance to Expressway." Photograph of British Columbia Electric Railway Company tram no. 1236. Next to the tram is a small wooden shelter with a sign on the side that reads, "BURNABY LAKE", and a silhouetted person walking on the platform. Note on verso of photograph reads: "BCER 1236 Burnaby Lake Station Aug 26 1951"
Photograph of an unidentified man and woman riding through the snow on a horse-drawn sleigh near Burnaby Lake. Note in pencil on verso of card mount reads: "NEAR BURNABY LAKE,/ Burnaby, B.C." Photograph of a leaf-covered walkway lined with trees near Burnaby Lake. Note in pencil on verso of photograph reads: "Near Burnaby Lake/ Burnaby, B.C." 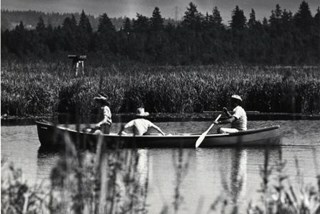 Photograph of the Haddon family in a canoe on Burnaby Lake in 1932. 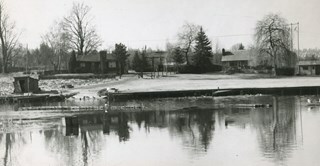 Caption on original matte read: "High water level of Burnaby Lake inundated the surrounding area. Two of the Haddon family in the canoe.". 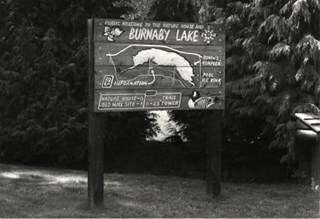 Photograph shows the sign in front of the nature house in Burnaby Lake showing the locations of the Nature House, the Old Mill Site, the Rowing Complex, the pool, the ice rink and the trail. 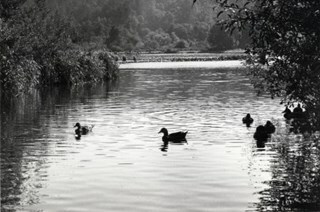 Photograph shows a view of Burnaby Lake with ducks in the foreground. 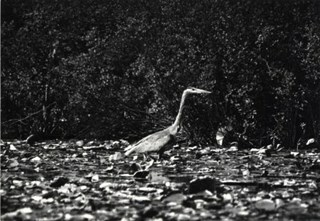 Photograph shows a blue heron near the shore of Burnaby Lake - one of the more than 180 species of bird and animal life that have been identified in the Burnaby Lake area. 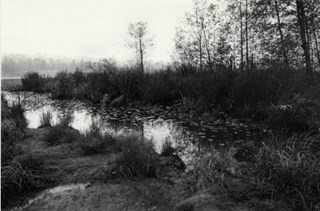 Photograph shows a marshy area on the north side of Burnaby Lake. 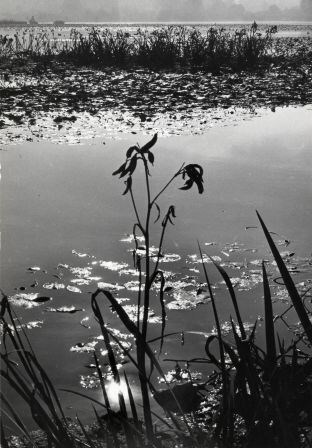 Photograph shows reeds and water lilies on Burnaby Lake. 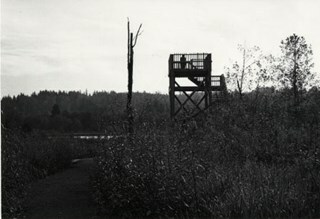 Photograph shows the 23' observation tower on the north side of Burnaby Lake built by Grade 12 carpentry students from Burnaby Central High School. Photograph shows canoeists along the rowing course at the west end of Burnaby Lake. 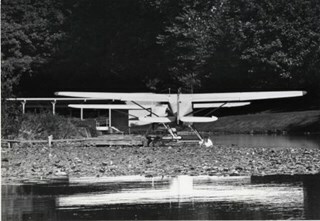 Photograph shows a float plane at the end of the rowing course on Burnaby Lake. 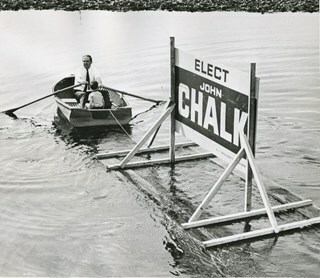 Although development of the Lake began in 1963, the rowing course was not built until 1972-1973. 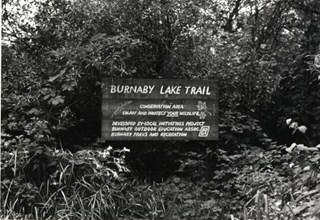 Photograph shows a sign commemorating the creation of a nature trail at Burnaby Lake. The trail was developed by a Local Initiatives Project in 1973. 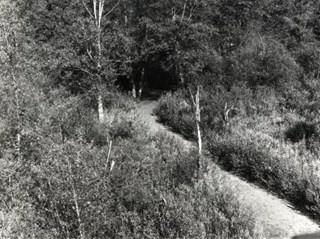 Photograph shows a section of the nature trail near Burnaby Lake. 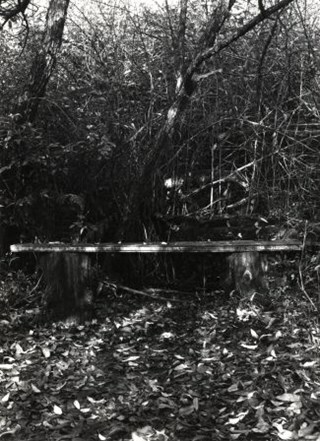 Photograph shows a bench along the Burnaby Lake Nature Trail.